Until the market is able to crack the overhead resistance, the next likely move would be a test of the current support level, which is likely to fail given the current, overall lack of bullish enthusiasm. The narrative could change shortly, but for now it’s “Chop City” until we can break the overhead resistance levels. Bitcoin has dropped 50% in one month. It continues to test previous support levels but has failed respect the prior levels. 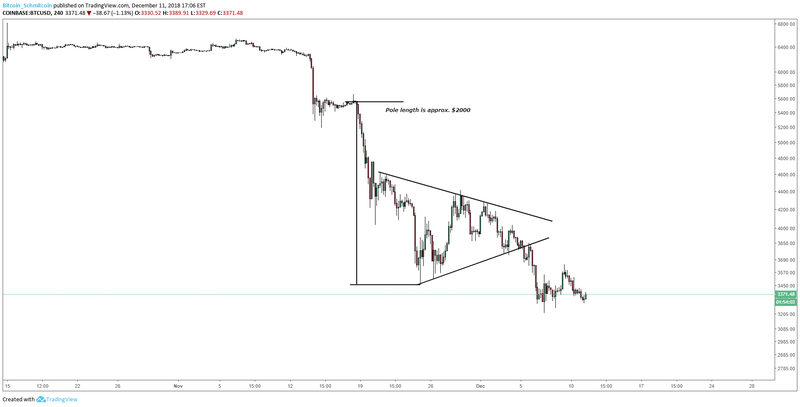 We are currently experiencing a breakout of a massive bear pennant that has a price target of $1700. If the current level fails to hold, the next move would likely be a strong move to the downside as we continue to test deeper and deeper support.